Sometimes you can’t see the wood for the trees. When you think of Thailand, images of white sand beaches fringed with palms trees come to mind. If you stop to look around on your travels you may start to notice another tree in proliferation, the rubber tree. Rubber trees are not native species to Thailand, the first being planted way back in 1899 by a Thai-Chinese investor. Today, Thailand only competes with Indonesia as the largest producer and exporter of natural ‘latex’ rubber. Almost 90% of all Thai rubber is exported and is used to make condoms, balloons, tires and surgical gloves. 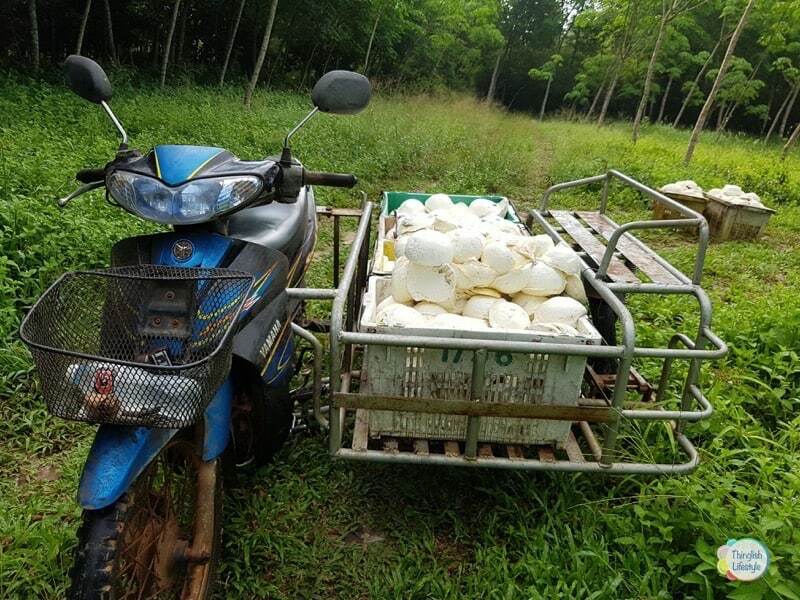 Incredibly, the Thai rubber export market nearly doubles that of its rice market. 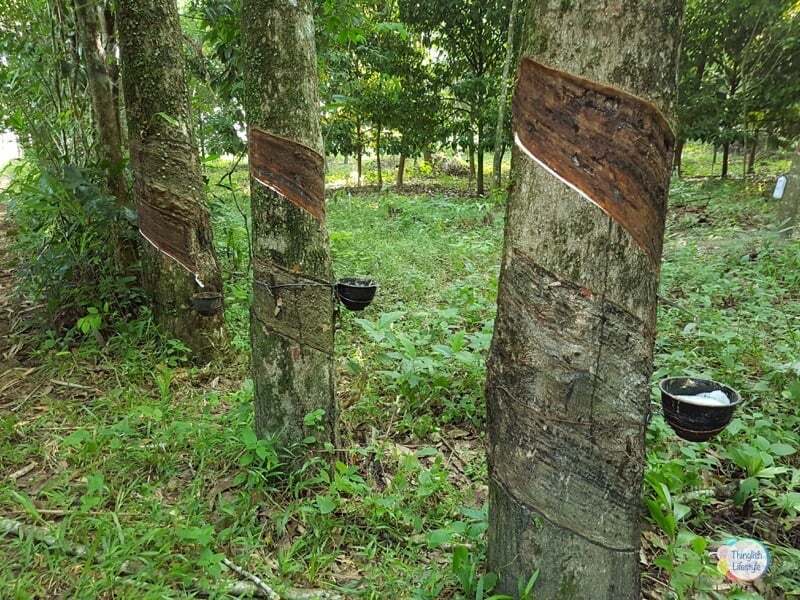 When you start to look around you will notice rubber tree plantations just about everywhere. 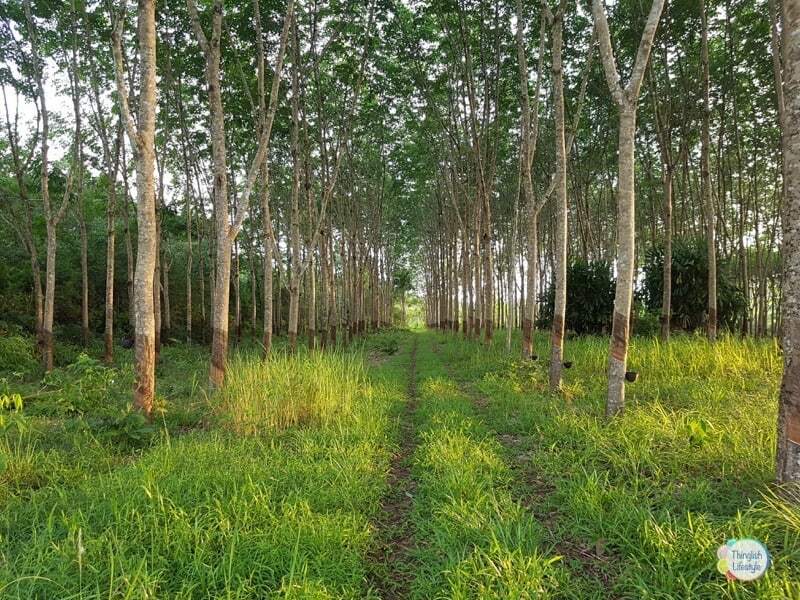 These monoculture, 20 foot high commercial rubber tree plantations are generally privately owned and it’s estimated around 1.2 million Thai households have at least one person who works farming rubber. When a tree is around seven years old it is ready to be tapped. This is done about every other day and mainly at night when it’s cooler. We sometimes hear our neighbors going out or see the farmers head torches among the trees from our home. Each time a tree is tapped it yields about 50g of latex and the life of a tree is approximately 30 years. 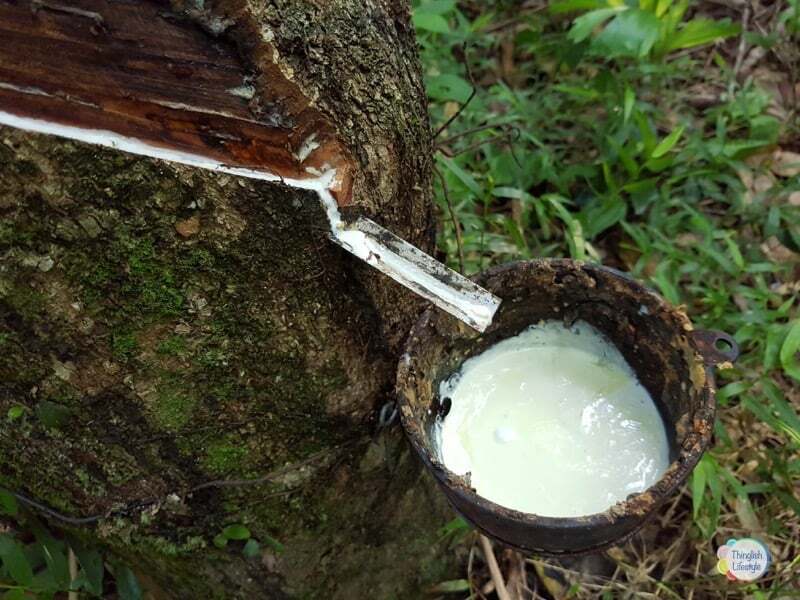 The latex sap is collected in a cup attached to the tree. The rubber farmer adds a drop or two of acetic acid (vinegar) to the latex that causes it to coagulate very quickly. The price of rubber seems to be quite volatile and has been hitting the lows for the last few years. I guess it’s part supply and demand and part tied to the price of petroleum. When the price of rubber bottoms or the trees reach a certain age, and produce only small latex yields, huge swathes of land are cleared and the trees are sold for lumber. This is made into furniture, plywood and composite boards. Pineapples are often planted on the cleared land as this is currently seen as a high cash crop when rubber falls. However, the price of rubber has a way of bouncing back! I walk our dog Taxi throughout our neighboring farmers rubber tree plantations every morning as part of our daily routine. It’s a great way to start the day. We can see the wood and the trees but we still have to keep an eye out for snakes, but that’s another story! Like this post or have something to add? Leave your comments below. Thanks for taking the time to write this information re the rubber trees. We have been driving through Thailand and seen them exactly as you pictured them, and we wondering about them. 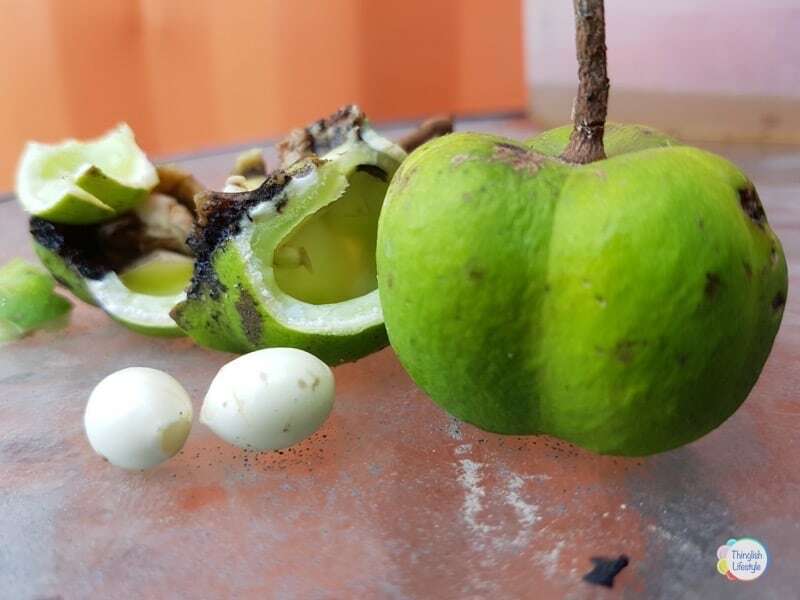 We had our questions answered, what is the rubber/latex used for, how old are the trees before they can be harvested, and what do they do with the wood on the trucks we see filled with them. Much appreciated ! PS Hope you and “Taxi “ continue to enjoy your morning walks and are avoiding encounters with the snakes! Hi Val, the latex is processed and made into items like condoms and surgical gloves. The trees start to be harvested from around 6 years after planting. Their life for producing rubber is between 25 and 30 years. They are usually felled then and more are planted so it’s a very sustainable crop. The wood in the overladen trucks you see everywhere will be treated and made in to furniture, toys and kitchen accessories etc. 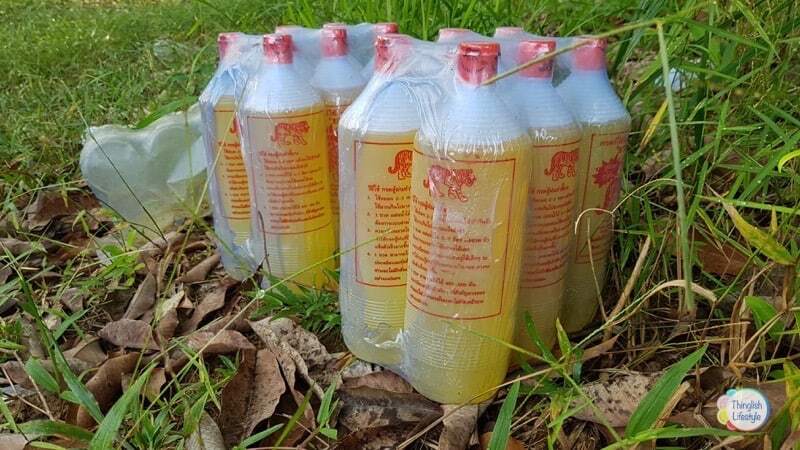 The price of rubber is very low at the moment so the government are giving small incentives to farmers to fell the trees and plant alternative crops.